Seagate's new officially licensed external 2TB hard drive lets you download, play, and store more of your favorite games. 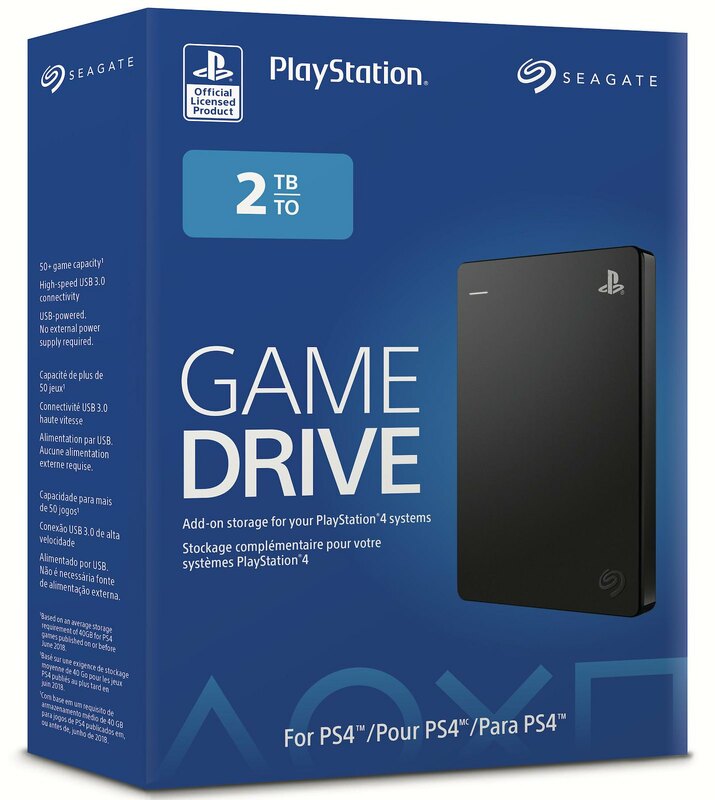 Today, we’re excited to introduce the officially licensed Seagate Game Drive for PlayStation 4 systems. 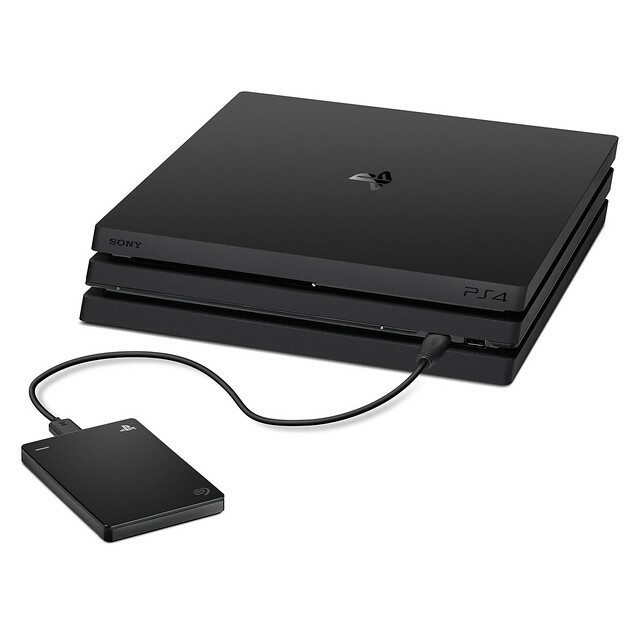 The new Game Drive gives PS4 gamers an extra boost in storage, with amazingly simple portability that allows you to carry your games with you. The Seagate Game Drive enhances the players’ gaming experience with easy installation, and direct connection via USB cable. Setup is easy, since the PS4 automatically recognizes your Game Drive and helps get it up and running in approximately three minutes. The new Game Drive for PS4 is available next week in North America for $89.99 USD (MSRP) / $119.99 CAD (MSRP) — look for it at your favorite retailers and online. Check out Seagate.com for more details. *Based on an average storage requirement of 39GB for PS4 games published on or before June 2018. That little PS logo is apparently worth $30. Right now on Amazon you can get this exact 2TB Hard Drive for $60. For $95, a mere $5 more than the “official PS licenced HD”, you can get the exact same Seagate Hard Drive but with DOUBLE the storage at a whopping 4TBs. That’s a serious problem with any of these branded devices. Shop around – any USB-powered USB3-compatible drive should work just as well as this one. I have an old 1TB portable (and a 2TB internal I installed the day I bought my PS4, years ago) and it works great. But if it goes on sale for the same price some day, I might pick it up for the PS logo. We’ll see. Can you list the best products that a similar to this? @TriggaHappy2313 I have a white Western Digital My Passport 4TB, works like a charm. So go buy yourself one off Amazon then. @Spazz3870 yeah god forbid anybody go out of their way to be nice and warn others who might not know of the price gouging. Do you have a link to what it is? I’m actually in the market for a memory expansion myself. Yes I would like to know where you purchased your 8TB external harddrive & how much it is? if you don’t mind me asking. I take it nobody reads – BEST BUY – I got 5 of them at BEST BUY in the 8TB format for around $150 each to replace the WD reds in my NAS and then took one of the old 4TB WD Red drives and put it in one of those new external cases I took the 8TB out of and have it hooked to the PS4. ANY external USB drive will work. You want USB 3 not 2 though. If you have an old hard drive laying around that works, you can buy an external case and use it for a drive on the ps4. Do not buy into this overpriced stuff just because it has a logo on it. It’s so great that Sony decided to only give us TWO USB ports on the PS4. Things that I can do with a USB port…. …but I have to choose which two to do. Way to cheap out Sony and future proof your console. USB hubs are cheap. I have an external drive, PSVR, wireless keyboard, and a USB flash drive all plugged in and working perfectly, also a dongle for my platinum headset.. $10 purchase, zero hassle. The PSVR doesn’t take up a USB port. I don’t think they “cheaped out” by only having two. The controllers can charge anywhere. Their official headsets are wireless, or simple wired ones connect to the controllers directly. The original PS3 had too many USB ports and having more ports impact the visual design of the system. PSVR does, in fact, use a USB port. However, unlike an External HDD, it can utilize a USB (3.0) hub. External Storage HDD must be directly connected to the console. Count again. I count 3. 2 up front and on in the back. The PSVR does take a USB slot, I have one so can confirm. There are 2 USB slots on the front or a PS4 and none on the back. The one on the back that looks like USB is for the PS4 cameras and is a different plug type with a notch in it. On the back of a PS4 Pro there is 1 USB and 2 on the front so they added a third one. Either way a hub is pretty cheap, I use one it works great. As for the controller, I charge mine using a phone style wall charger and a USB cable works like a charm and saves a slot on the PS4 and the cable trailing across the floor to the console. There, all solved. Launch PS4 has only 2 USB ports. The Pro has the 2 in front plus 1 extra in the back most likely for the PSVR. Not sure about the Slim. You can charge a controller from any USB power supply – you don’t need a special one like you did with the PS3 (Dualshock 3 controllers won’t charge on a power-only cable, for some idiotic reason). Use the charger for your phone to charge a Dualshock 4, it works fine. USB hubs are cheap and effective. Your complaint doesn’t seem credible. As many already pointed out, PSVR does take up a USB port. You can search for it, the connection diagram clearly shows a USB cable connection. Also, even though the official PS headsets are wireless, they use a USB dongle to connect to the console. And if you use an External Storage HDD, it needs to be connected directly to the console. So yeah, they “cheaped out”. Why do you think the Pro has an extra port on the back? They knew it was needed. And 3 is still not enough for everything Sony wants you to connect at the same time. Sure, you can use a hub to connect many of this accessories, but that breaks practicality and means more cables and hardware taking up space. Visual design should be built around capabilities, practicality and usability, not the other way around. The Original PS3 was great in that sense. You can always charge your controller with a portable charger (the ones people buy for their phones). I use mine all the time when I have all day gaming. Hope you are trying to be funny? Anyway, I have the exact same drive in blue without the housing having the PS4 logo. Since my PS4 slim is Blue this actually looks like a downgrade. Black and logo so small it can’t be seen unless to are really trying too. Amy Michaels has really been missing out. She’s only now playing Uncharted 4 for the first time. While I really want to jump on Sony and complain how out of touch they are when it comes to pricing (after all, look how much more expensive games on the PS Store are VS their physical counterparts, or how sales on physical games blow away their digital counterparts) however I understand this is being sold by Seagate and just licensed by Sony, so I know where to place the blame this time around. 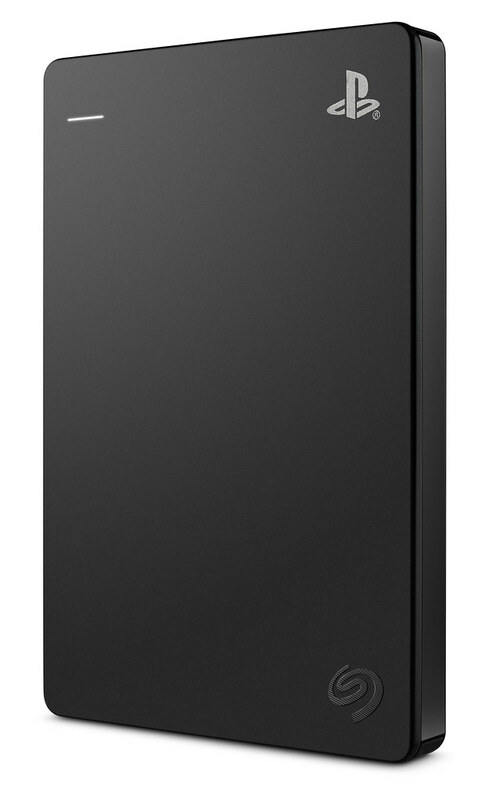 Sadly, I upgraded to a 4TB external several months ago, the Seagate Backup Plus 4TB Portable External Hard Drive USB 3.0, Black (STDR4000100) to be exact for $110.97 CAD from Best Buy. Double the storage cap, for less than the same price…that PS logo and cardboard box though sure are pretty. So to see this 2TB that holds 50 tiny games shows how totally lacking in hardware sensibility Sony really is. Sony hurt their PS4 with having only 8GB Ram when PC games were already running 16GB Ram at 120 fps. Then they put a 500GB drive in when at the time PC and even XBox had 1TB. Now they are so proud of a 2TB external hdd when the current meta is 4TB. Internal HDD for PS4 are currently at 2TB to swap in. I am running 7TB and have over 250 games loaded,which are every PS+ game along with many Triple A titles. The ability to start any game in my library is convenient and much more. Now if Sony would fix the folder issue of external hdd crashing the PS4 causing folders to disappear placing every game back on the XMB. I also want to comment that the next playstation console better not think game streaming or weak hardware will sell. Next PS console needs minimum 4TB standard or fixing the issue with the game data install files. What are you talking about? The Xbox did not have a 1TB hdd at the time, it also had a 500gb hdd, so get your facts right rather than spreading inaccuracies. And most PC games were not using 16gb of ram at the release of the ps4! Seriously, if you are are going to complain about something at least be right. 90 is pretty pricey in my eyes. 65 would of been a better pricing option. My 2 tb is basically filled and its annoying to keep deleting older games I finished or am not playing anymore every time I get a new game. Sad that I cant use the last 90 GB on my PS4 and keep having this headache. Ease to bring to a friends house? Umm you guys need to talk to your system software team. This was anything but easy. I have a 4tb, I hooked it up to my brother in laws ps4 to play some overwatch before bed. Instead of just letting me hop on and play, it arbitrarily decided that I couldn’t do anything until I either deleted a version of a game from the external or the internal. I didn’t want to do either. I wanted my game available to me after my flight home the next day. I didn’t want to inconvenience him simply because we both had god of war installed to the drive. This needs to be fixed. Ps4 shouldn’t just fall apart over duplicates. For what ever reason it obliterated two of my games anyway as I had to redownload them when I got home. Including overwatch for what ever reason. So in other words, it’s exactly the same as any other external hard drive that you can buy for much cheaper? Came for the comments, left with the intent on buying the 4tb from Amazon ‍♂️… Thanks peeps. Sony must be taking leaves out of microsoft book as this is a complete rip off as said before the exact same external drive can be purchased anywhere and a lot cheaper this is nothing more than brand name selling please dont go down this road Sony its part of the reason we love you. Microsoft did the same thing with an Xbox Segate drive and same story. Always cheaper to buy the same standard Segate drive without the branding a save a few bucks. These aren’t meant for people like me (read way too much about video games) these are made for people like my brother or my mom which buy things when they’re at Best Buy amazed that things like this exist in the first place. $89.99 for an external HDD from Seagate? Even though it’s officially licensed, the fact that it’s manufactured by Seagate is a no-no IMO. In regards to HDD or SSDs, I trust Western Digital and Samsung more. I’d rather spend a little more and get something that is better quality. Seagate is not the best choice with computer storage. Yeah, I just bought a 4TB drive for $120. Works great. Plus any account on the PS4 can access games as far as I know. People aren’t happy unless they are complaining about something. Yes, most know there are cheaper drives or better ones. However, some people aren’t technical and will see this branded for PS4 and therefore purchase it. It’s not complaining, it’s called informing. You’re absolutely right that people will see this branded for PS4 and therefore purchase it, and we’re here to help them from throwing away their money in ignorance. It is complaining, if the less knowing REALLY wanted to know thety would do research or look into it. The only way they are “throwing away money” is if it external doesn’t work. You can get the same exact drive from Amazon, minus the fancy box and PS logo. It’s been out for a couple of years I believe. I purchased mine last year during Black Friday, and paid only $42 bucks and change. I guess the Sony stockholders need to get paid lol. what about other countries? like argentina. i need one. I’m amazed about all the people that already have even bigger HDDs connected to their PS4. Why do you need the space? I delete an old game before installing a new game. If I ever wanted to play an old game again, I would download it again. One reason I could think of is your internet speed. I have a 50Mbps, and games download and install really fast. Do you have lower speeds? Why i want to buy this after seeing this ad? ?? Am I stupid??? I just got the 4TB WD Elements drive for $100. A more reliable brand and double the storage for an additional $10. I paid $90 for a 4tb WD with free shipping on ebay about 5 months ago. Works great, no more deleting games to make room anymore. I have somewhat slow internet since I use internet via my phone. Takes about 6 to 8 hours for a 40gb game download. As one comment mentioned.. A big pita is if you take this over to a friends, if you both have the game installed it will ask for one of the games to be deleted either from the hard drive or your friends console in order to use the external hard drive. And also dont forget to deactivate your ps4 at home where the main ps4 was that had the HD attached to it. I WASNT able to deactivate mine from his house using online features. You have to deactivate in order to use this on someone elses console. Heres one just like I have for $84.99. Its New with free shipping on ebay thats located in Texas. Its the Western Digital My Passport 4tb 3.0 usb. Dont get the Mac one if this is sold. They only have the One. Its worked great for me and Ive had mine for about 5 months and still going. This is $5 less than what I paid for mine. I bought the Seagate Firecuda 2TB drive for the internals of the PS4 pro and added a 8tb external just in case. “Easy to bring to a friend’s place to play your games on another PS4 system (do note, once content is stored on the drive, the content can only be accessed by the account that transferred the content)”. Correct me if I am wrong but to my knowledge i can just plug in my External into another PS4 and play my games can ? I have an 8 TB external and can bring. My 100s of games everywhere if that the case. A portable arcade basically. Can someone confirm or deny? Well Sony needs to clarify this, however I will say that I was not able to plug my 8tb drive from my old PS4 into my PS4 Pro. The PS4 Pro didn’t even recognize that an external drive was connected. Only a brand new 8tb drive that had to be formatted by the PS4 Pro was recognized. Original 8tb unrecognized drive works fine when plugged back into original PS4. So unless Sony has done something special with this drive to make “portable”, I’ve not been able to use any of my HDDs on different PS4 consoles which I own and use the same profile. That sounds weird. There shouldn’t be any difference between this drive and a generic one you can buy and reformat to serve the same purpose. Not sure what’s happening with the guy who is not able to use the hard drive on his PS4 pro and regular PS4, but could it also have something to do with the PS4 pro having content that’s not compatible on the regular PS4? Unlikely but that’s my stab in the dark. I’ll pay the inflated price if you allow me to plug it into my PS3 and use the external HDD for games on my PS3… what say you? Your move Sony. Purchased two Seagate 2TB for half the price they are asking, any Seagate will work on the PS4 including the Xbox Seagate. I love Playstation but I am not stupid enough to pay for logo. Wait till it gets cheaper in six months because of poor sales then I will buy. 2TB almost filled and will need more. The biggest design flaw of the launch PS4/PS4 slim is the lack of USB port on the back. Someone earlier in the thread suggested that more USB ports “impact the design” of the machine. Well, you know what is even more impacting, in a negative way? Having to plug an external hard drive into the front of your snazzy looking console, not to mention using up one of the precious USB ports that you usually need for other things, such as charging controllers, using PSVR, etc. I personally hate having wires sticking out of the front of my machines as well, so I’m thankful that I can at least install a much bigger hard drive internally (for the same price or likely much less than what this branded 2TB drive costs). Hopefully Sony will consider the needs of consumers more carefully and design the PS5 with at least ONE USB 3.0 port on the back. A USB HUB can be plugged in the back discreetly, so it’s not like we need a ludicrous amount (like the original 7 ports Sony promised with the original $600 PS3!). A rear USB port should not be reserved to premium units like the PS4 Pro. It needs to be a standard feature. I installed an internal 2TB into my PS4 about 2 years ago, I didnt want an external 2TB because of the ugly wire having to be infront of my system all the time, I dont regret it one bit I believe I paid around 90.00 for the kit from SeaGate.im very happy I went this route , plus I still have a great deal of storage . Frees up need for usb port on console or manually plugging in. Right next to couch and just pick it up and play. Also did a standard WD 4tb drive for less. Branding is overrated. Not going to break or void anything. I really hope this comes to the UK. I want one!